In my previous post I said I might post a picture from Lexington Reservoir. Well, I actually decided to put that picture in my California Gallery on PBase, so instead I have a different landscape shot for today. This was again taken with the IR camera yesterday. I think the clouds look simply unreal and though the photo lacks any real foreground element (the tree isn't as prominent as I would have liked it and this was on 'protected land' so I couldn't move up closer), I still find something about it interesting. What do you guys think? 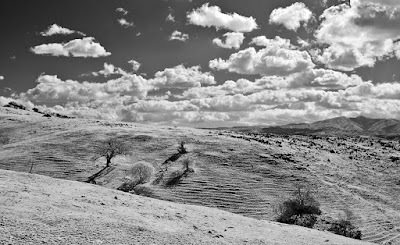 Technical Specs: Canon Rebel XT IR, 17-40 @ 24mm, f/8, 1/640s, ISO 200. I think the shadows are what make the photo interesting for me. The trees, although small, are very striking and the ground accents the clouds well.